48. INTRODUCING- ROSA PARK -Rosa is 31. She is the editor of one of our favourite publications, CEREAL Magazine. Cereal magazine is a beautiful travel and lifestyle bi-annual magazine, that tells stories - many of them about people, of the labour and love that goes into creating a product and of destinations we all add to our one-day-i-must-go-here list. Rosa and Rich are the dynamic couple behind Cereal and as far as vision and aesthetic is concerned, they couldn't be better matched. They make us see the world through Rich's hazy lens, which captures people and places in such a delicate way that there is almost a weightless quality to his pictures. Here he photographs Rosa at their home in Bath, UK. 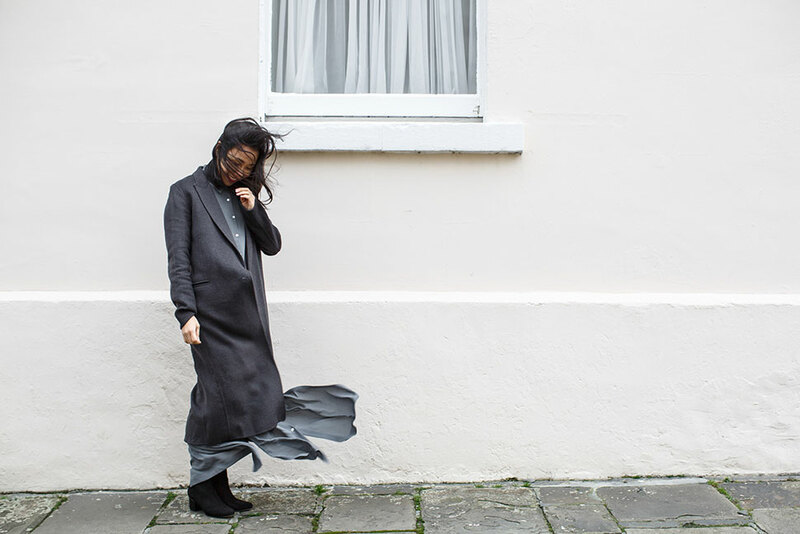 Rosa is wearing our grey DREE shirt dress with a Toast turtle neck jumper and a grey Sandro wool coat. Sam Edelman black suede boots. Love bracelet by Cartier, metro three-row hinged bangle by Tiffany. The remaining rings, necklace & bracelets are by her mother's jeweller. 1. Cereal will be publishing its first book this autumn! I’m very excited about this. Keep an eye out for it! 2. My favourite restaurant of the moment is Yam’Tcha in Paris. Their tasting menu with the tea pairing is one of the most memorable meals I’ve had in quite some time - a perfect marriage of Cantonese and French cuisine. Their decor is beautifully subtle; I especially love the murals on the walls in muted tones. 3. If I had to pick one city hotel to live in, that would be Aman Tokyo. Kerry Hill, the architect of this property, did an incredible job integrating traditional Japanese materials and elements into a thoroughly modern (and striking) design. And the ikebana here - a traditional Japanese floral arrangement that I’ve long loved - is the best I’ve ever seen. Plus, the service at the hotel is second to none. Aman never fails to impress.
. I’m drawn to his use of colours as well as the free, organic forms in his paintings. 5. I have one destination at the very top of my travel wish list, and that is Bhutan. I will make it out there in the next year.